It is the second weekend of French citizens protesting against rising fuel prices. Emmanuel Macron, the current President of France, has faced criticism over the last few weeks over his policies regarding fuel prices. This is the second weekend of 'yellow vest' protestors moving through the Champs-Elysées, an avenue running through where the Arc de Triomphe is located. It has been estimated that several thousand protestors have gathered with 3,000 police officers being deployed. Tear gas and water cannons have been used by the National Police in an attempt to disperse the large crowds that attempted to break through security cordons set up by the police. 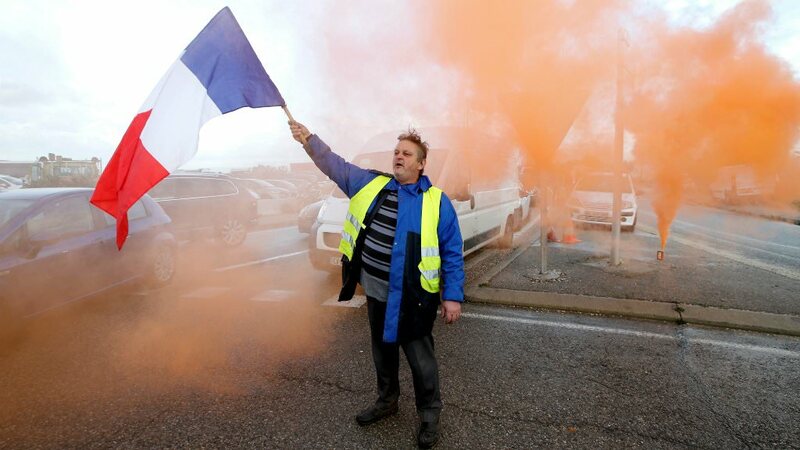 It is required for all drivers in France to carry a HiVis jacket in their cars at all times, hence the anti-Macron movement wearing the yellow vests during their demonstrations. According to reports, protestors have blocked highways and access to petrol stations, shopping centres and factories with large, slow-moving trucks and burning barricades. Protestors have also been seen ripping up paving stones and throwing firecrackers at police cordons whilst singing the French national anthem or carrying signs with slogans saying things such as "Macron, resignation" and "Macron, thief". Fuel prices in France have risen 23% over the last 12 months to an average of £1.32 (€1.51; $1.71) per litre, with many protestors blaming Macron's government for the staggering rise in prices. Christophe Castaner, the French interior minister, accused the movement to be influenced by the leader of the far-right National Rally party, Marine Le Pen. Le Pen has since publicly tweeted that Castaner has been dishonest to the French people. Are the PROTESToRS being too violent? What are fuel prices like where you live?